The global technology landscape is evolving with the advent of new technology themes, evolution of software development practices, and the increasing focus on consumer-centric solutions. In this era of “software-defined”, software is gaining precedence for both technology vendors and enterprises to create a differentiated value proposition in the market. At the same time, factors such as increasing architectural complexity, the need to develop more intuitive software and user interfaces, and in some cases, dearth of suitable in-house talent, pose challenges for them in maintaining and expanding their software portfolio. This is compelling software vendors and enterprises to collaborate with service providers who can not only help them traverse these challenges in software development but also accelerate the time-to-market and lower costs. Service providers, particularly IT-heritage service providers, also view this space as a high-growth adjacency as the growth in traditional IT engagements slows down. 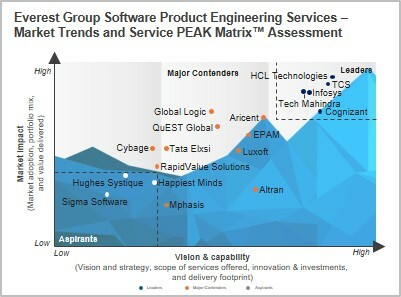 In this research, we present fact-based trends impacting the software product engineering services market, along with the assessment and detailed profiles of 18 software product engineering service providers featured on the software product engineering services PEAK Matrix.